Members collected and delivered to the Ronald McDonald house, needle art projects and craft materials for family members of patients at the Children's Hospital. Also made things and donated for the preemie babies using the project Touching Little Lives. Members made sewing kits for distribution by county Extension Agents to families in need. Members made and donated bookmarks for a neighborhood school. Also made and sent kissing pillows. 18 of our active members and some community members have made over 300 Soldier's Kissing Pillows. We invited the community to attend 3 stitch-ins during the summer of 2008 to work on the pillows. Our purpose was to make as many pillows as we could, to put our name out into the community and to recruit new members. Five new members have joined our Chapter. We have distributed most of the pillows through the Family Advocacy Program at the Federal Center in Battle Creek, Michigan. Family Advocacy prepares packets for families who have a member who is being deployed overseas. Back row: Kathy Thornton, Andrea Bailey, Kay Owens, Kelly Keating. Front row: Bette Lee Serbantez, Outreach Chairman, Delia Vela, Vida Ziegler, Brittany Owens, Suzanne Knox. Members made 10 bookmarks for their local library in September. They also made and sent 130 kissing pillows as well as participated in the Handmade afghan project for soldiers at the Naval hospital and sent 12 squares. Members collected and donated food to local food pantry. Members donated stitched squares to the local Hospice organization. These needlework squares are then mounted on cards and sold at Hospice functions & at the Center for Performing Arts in Munster, IN. A description of the project is up on our blog. The Coordinator was Chris Retseck. The chapter made and sent 200 Kissing Pillows to military personnel and their families. Members made and sent 79 kissing pillows in September. They also made and sent 28 stitching kits for soldiers. In 2009, Youngstown Area Chapter members were busy fulfilling their commitment to a number of Outreach projects. As we generously shared our stitching talents and time, we built friendships that will last a lifetime. We have found that not only do we share a love of needlework but also help each other in times of need. We offer support during personal crises and in times of joy and loss. One of our Outreach commitments is framed samplers for the Habitat for Humanity houses dedicated in Youngstown. Ruth Ebert chairs this very important and much appreciated program. Our members stitch the samplers as needed, Ruth obtains the frames, and Ken Alcorn of Photographically Yours, Columbiana, Ohio, mounts the samplers. Ruth ensures that the samplers are personally presented by chapter members to the new Habitat home owners. In April, we added to our list of Outreach commitments the Kissing Pillow Project for deploying armed service personnel and their families. From April to September, members stitched more than 200 pillows. Todd Murdock finished the stitched designs into pillows using donated fabric and polyester filling. In September, she proudly presented more than 200 pillows to Colonel Karl McGregor, 910th Airlift Wing commander, Air Force Reserve Base, Vienna, Ohio. In 2007 we started the chapter developed and sponsored Totes for Tots as another Outreach project. 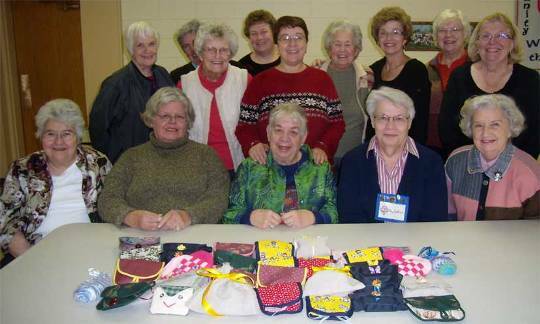 In 2009, Lue Bukovinsky, Carole DeWitt, and Charlotte Gengler sewed 65 quilted totes with chapter-purchased fabric, and Lue put chapter-member donated materials of a coloring book, construction paper, crayons, a pair of scissors, and a stuffed animal in each tote. Akron Children's Hospital of Mahoning Valley and St. Elizabeth's Medical Center, both in Youngstown, Ohio, give the totes to young patients in hopes that the art materials would help relieve some of the boredom that comes with extended hospitalization. Each year since 1996 our members taught classes in cross stitch to boys and girls at local schools. We have taught Easter, Mother's Day, and Christmas designs using kits donated by needlework suppliers and materials donated by chapter members. In October, Ruth Ebert, Judy Power, and Sally Svoboda taught a DMC-donated cross stitch design to ten girls in a Holy Family School after-school class. Every year since 1998, our members stitched over 100 ornaments for the Ireland Cancer Center in Cleveland, Ohio. The Center is an outpatient oncology unit that enables children to receive prolonged chemotherapy treatment without being admitted to the Rainbow Babies and Children's Hospital. Sue Moore, an area former needlework shop owner who is dedicated to this effort, provides the copyright-free design, finishes the stitched designs into ornaments, and decorates trees that are displayed at the Center. A child who has received a cancer treatment may select one of the ornaments from the tree. This year we gave Sue 111 ornaments and a monetary donation for the Center's toy chest.